Leroy E. Van Cleave, 60, Wahpeton, ND died on Thursday January 10, 2013 at the Veterans Administration Hospital, Fargo, ND. Funeral services will be held on Tuesday January 15, at Bethel Lutheran Church, Wahpeton, ND at 11:00 A.M. with Rev. Jim Gustafson officiating. Visitation will be held on Monday at the Willow Creek Chapel (920 3rd Avenue North) Wahpeton from 5:00-8:00 P.M., with a 7 PM Prayer Service. There will also be visitation one hour before the service on Tuesday. Leroy was born March 23, 1952 at Breckenridge, MN the son of Gerald and Kay (Carr) Van Cleave. He grew up south of Wahpeton and attended rural school at Center and Summit. He attended junior high and high school in Wahpeton and entered the US Air Force. Leroy married Patricia Armstrong on December 2, 1972. He served for seven years as an environmental specialist in various bases in the US, including Southeast Asia until 1978, with the rank of Technical Sergeant. He returned to the Wahpeton area and joined the Air National Guard for the next twenty years; being proud of his association with the "Happy Hooligans". During this time he drove truck privately and with Murphy Transfer, Three Rivers Trucking, Wahpeton; Charlie Green and Hi-Tech. He married Eileen Nelson on September 17, 1993, they made their home in Wahpeton. In recent years as health declined he enjoyed remodeling and woodworking. Leroy enjoyed hunting, fishing, camping and gardening. He was a great fan of John Wayne, especially after meeting him. 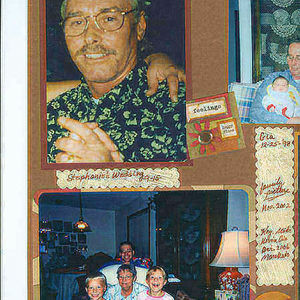 He especially enjoyed his time with his children and grandchildren. Leroy is survived by his mother, Kay (Van Cleave) Iverson, Wahpeton; his children: Roger (Jamie) Van Cleave-Knotts, Battle Ground, WA; Marie (Vincent) Herberg, Black Hawk, SD; Michael Van Cleave, Wahpeton; Jessica Van Cleave, Wahpeton; grandchildren: Samantha (Kasey) Kaseman, Rapid City, SD; Nicholas Herberg, Black Hawk, SD; Gia and Nevin Van Cleave, Fargo, ND; Jordis and Jaydin Knotts, Battle Ground, WA; two sisters, Terry (Michael) Lee, Berthoud, CO; Sandra (Wayne) Brekke, Mankato, MN; his mother-in-law, Audrey Nelson, Moorhead, MN. He was preceded in death by his father, Gerald Van Cleave, his wife Eileen, infant grandchildren, Cody Herberg, and Joshua Van Cleave and his father-in-law, James Nelson. Sorry hearing about LeRoys death. I last came across him about 25 yrs ago when he made a delivery to where I was working in Oakes. I wish we would have had more time to talk but didn't. Hello Terry and Sandy after all these years. Sandra & Terry, So sorry to read about your brother's passing on. My thoughts and prayers are with you. Couldn't help but laugh & chuckle when catching up on old times with Leroy at our last class reunion 2011. We talked about square dancing, visits to the farm, & throwing snowballs at cars. Now I know 60 isn't suppose to be old, but time does tick away when the adventures that we all find ourselves on speeds that time up so very fast, you know you gave your life its all, and that's exactly Leroy did. RIP my friend. My sympathy and condolences to LeRoys' family in their loss of a father, brother, son and in-law. LeRoy was a classmate of mine, so have known him all my life! He was a very friendly, likable guy and loved to visit. I will miss those visits! Your smile will be missed but not forgotten! R.I.P. Leroy! I had the privilege of working along side Leroy as a fellow Happy Hooligan. He was very knowledgeable and fun to be around. He will surely be missed. My thoughts and prayers go out to his family during this difficult time. I worked with Leroy at the NDANG. I always enjoyed his sense or humor and appreciated his work ethic. He was a good guy and will be missed by many.